Plain yogurt is so awesome - just add stuff to it and go! Quick and dirty post today. I am constantly on the quest for new ways to use up yogurt and it’s so great for dipping stuff into. 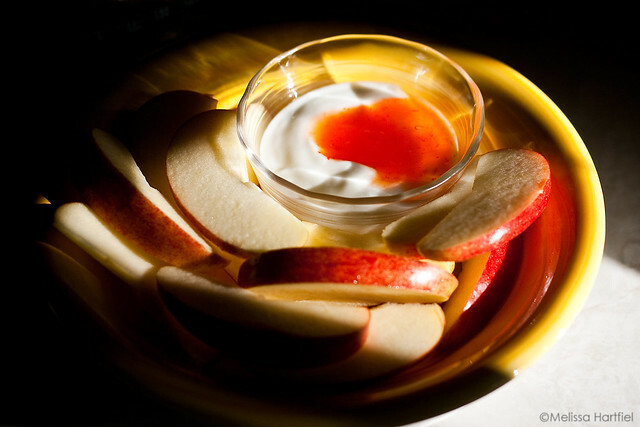 I like apple slices for my mid-afternoon snack and they go well with yogurt. This is a quick and easy dip (really… 30 seconds at most) and after the success of the vanilla cinnamon dip I thought I’d post this one as well. Although, it’s almost embarrassing to post because it’s so fast and simple. Mix the two together and… umm… yeah… there you have it! Hehe. Told you it was fast and simple! I sometimes add a dash of curry powder or cumin as well. It’s great for dipping apples, veggies, or thin crackers in. And I haven’t tried it, but I have a feeling it would work really well with strawberries. 50mm, f3.2, 1/1250, +2/3 exposure compensation, ISO200. Post processing was a contrast tweak and overall sharpening. 30 seconds total. This is a different type of photo than I usually take. The sun was streaming in for the first time in days and I couldn’t resist going for some really sharp contrast shots. I did take a few with filtered sunlight but, I think it’s fun to mix things up sometimes and try something different. Oooo….I like this mix. I never really thought to do a spicy yogurt dip….I usually pair mine with a spicy food. Experimentation ahead…yes yes. This sounds like such an interesting mix! I bet the spice goes really well with the yogurt, I’ll have ot give this a try! Oh my goodness, that dip is definitely going to be a hit at this house! Great recipe! I’ve been frantically looking around for a quick and easy appetizer for a party I’m having tonight, and this sounds delicious -and- easy. I may have to give it a try! Also, I -love- the photograph. The colors and shadows are beautiful. Well done. Hi, needed a quick and dirty, and different, dip for a little gathering Christmas Eve, and this will do perfectly. I will serve it with jicama, and bell peppers, a few strawberries and watermelon cubes. Thanks for such a fantstic idea, This is a keeper!